We at Griffith Barracks Multi-Denominational School celebrate and embrace difference and work towards creating an inclusive learning atmosphere. Teachers and Parents work together to maintain a friendly atmosphere while encouraging the children to do their best in a variety of ways. We believe that all children have much to contribute and we try to provide each child with the opportunity to discover and develop his/her talents. We recognise the importance of local action within the global environmental context and work to improve our local environment. We provide an equality-based education, guaranteeing equality of access and esteem to children irrespective of their social, cultural or religious background. The child’s identify is affirmed and validated in our school. The school is learner centred in its approach to education and is run democratically, with respectful partnership between parents, pupils and staff. We have assembly every Wednesday morning, at which one class will perform a song or a poem; we also give out merit certificates for students who have behaved well, produced good work, tried hard, were friendly and pleasant to classmates, etc. We award the green flag to the tidiest class (as chosen by the Green Council, and we also award the golden clock award for punctuality. We usually end with a song. 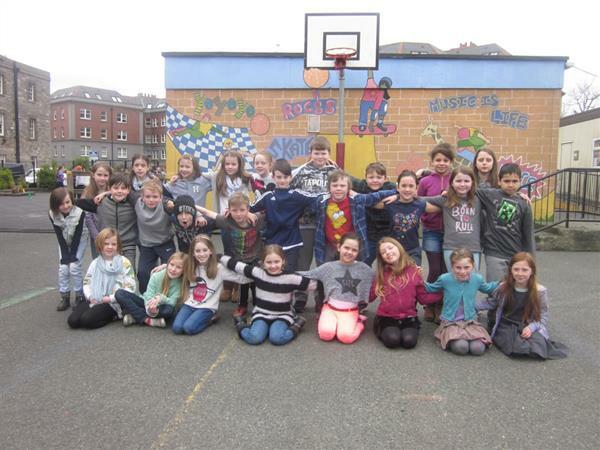 We have been awarded five Green Flags from An Taisce, which are given to schools that are environmentally friendly. ‘Bow Wow Scooty Day' takes place every Wednesday to promote cycling, walking and scooting to school. We award the golden shoe, helmet and scooter for the class that had the most children walk, cycle or scoot to school. Our Green Council work very hard on our behalf to make sure that we stay environmentally friendly. We also listen to the views of the children through the Student Dáil.